I love the look of washi tape on paper layouts, and I wanted to recreate the same effect for my digital layouts, so I designed the Fuss Free: Wishi Washi series ~ Fuss Free: Wishi Washi 3 and Fuss Free: Wishi Washi 4 are two of the newest sets in the series. 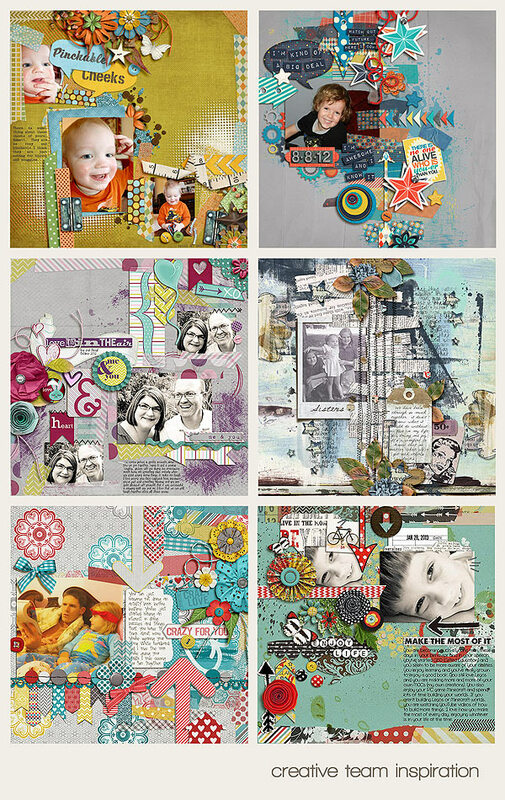 The backgrounds of these templates are covered with lots of paint and washi tape to help you create one-of-a-kind artsy layouts. You can clip paper to the tapes or recolor them to add a unique hand-crafted look to your pages, or replace them with washi tape that you can find in most current digital kits. Purchase Fuss Free: Wishi Washi 3 and receive Fuss Free: Wishi Washi 4 FREE. These sets are Fresh Fruit priced at 20% off ~ that's $3.60 for 8 templates. This offer is valid through February 27, 2013. Also releasing this week is Fuss Free: Now Showing. Each template in this set was specifically designed for Scrapper Bowl 2013 at Scrap Orchard. If you missed some of these templates during the Scrapper Bowl festivities, they are placed together in this pack for your purchasing convenience. Finally, I'm releasing Fuss Free: Feathered Autumn. This two-pack of templates was designed to coordinate with the other products in DSA's Grab Bag for DSD 2012. Bracket mats, paint misting and loads of flowers and leaves pile up to imitate the falling leaves of autumn. We're expecting a lot of rain here this weekend, so I plan on snuggling in at home with my laptop and doing a lot of creating. I hope you are able to do the same (well, without the rain anyway!). ((HUGS)) and have a great week!